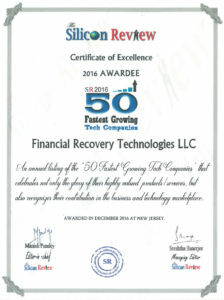 Financial Recovery Technologies has been named to the Silicon Review’s “50 Fastest Growing Tech Companies”. FRT is proud to receive this recognition for our contributions to the class action industry and the technology marketplace. Read the Silicon Review’s interview to learn how FRT’s commitment to technology, innovation and expertise has contributed to our success.